I suppose the phrases "shipping container" and "great design" don't really work together in the minds of the average consumer...but once you get sight of these beautiful creations/recreations in architectural design and building - you just might change your mind. 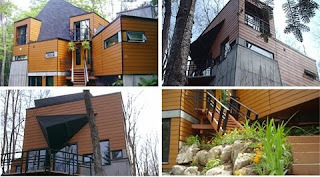 Welcome to the shipping container house in Quebec. 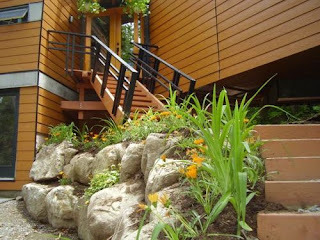 The home was a labor of love by a couple intent on reducing the amount of wood that goes into building a home and reducing costs. The four bedroom home features 3,000 square feet of living space. A traditional house of that size with of this size with wood framing would have cost the family at least $400,000, but instead cost the family only $175,000. That’s $58 per square foot ! 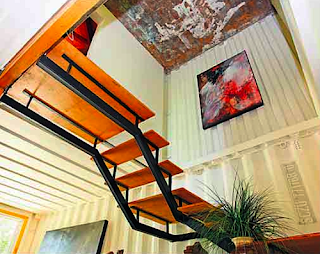 Which is one of the reasons why shipping container homes are becoming increasingly popular - they’re cheap to build (no small detail in these economic times). They also have a number of other benefits like structural stability, low-maintenance, rot- and mold- proof, and they are very easy to put together and construct a home in a short amount of time. This home took only 10 months to build out. Shipping containers are traditionally used to carry goods via cargo ship, train or truck, these steel boxes are capable of withstanding huge amounts of pressure and weight. This makes them structurally stable, fireproof, mold-proof and weather-proof. Unfortunately each has a lifespan of only twenty years for its original purpose. That means when their work is done hauling stuff, they get retired and sent to junk yards or landfills even though they are still structurally solid. Now architects and designers recognize their usefulness as building blocks for stylish homes, offices, apartments, schools and more. Thank you for sharing this. 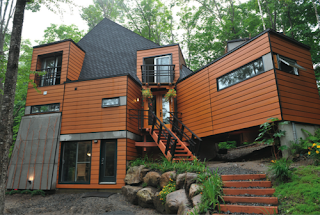 I have never heard of using shipping containers to build houses out of, what a great idea. I can't wait to share this with my husband. Brilliant idea. Container building will be more and more popular for it's simplicity, easiness and eco-friendliness.